The For Rent Flag is 8' Tall to Demand Attention! Other Real Estate Messages Available as Well! 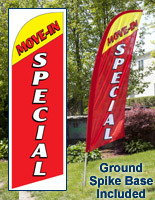 Each For Rent Flag Comes with a Ground Spike Base For Setup on Grass! 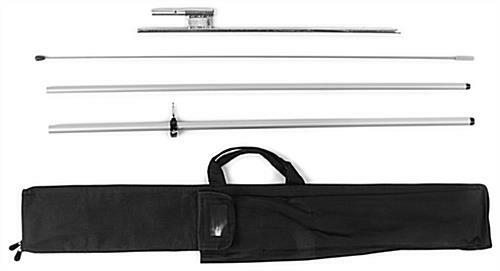 4-Piece aluminum & fiberglass pole is lightweight and affordable. 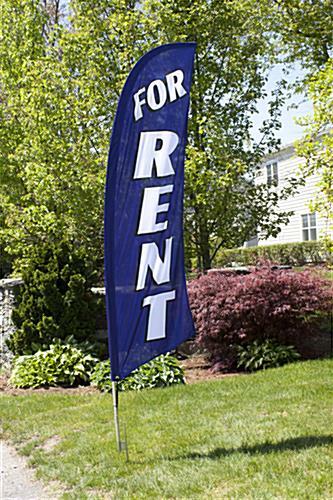 This FOR RENT flag, called a feather banner, is one of the most visible ways to promote vacant rental homes, flats and apartments. Bold, white text on a blue backdrop ensures potential renters can read the message from afar. The effectiveness of this FOR RENT flag is derived from its simplicity. Passersby will have no doubt that the home or complex they drive by has vacancies ready to be leased. The 8' FOR RENT flag is large enough to read from a distance, yet not so large that multiple people are needed for set up. 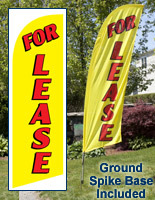 Portability is a feature realtors and property managers love about this series of real estate banners. 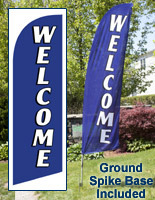 The FOR RENT flag that has a polyknit construction comes with an aluminum and fiberglass pole. The pole separates into four pieces that correspond with a slot in the carrying bag. 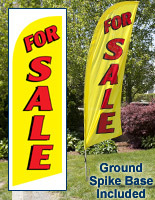 The FOR RENT flag flutter banners come with a ground spike base so they can be set up on any grass covered surface. Inside the nylon carrying bag, the pennant and ground spike also have separate storage compartments. The FOR RENT flag that flutters in the wind bows and bends in the same manner a blade banner with a100% fiberglass flag pole does. However, the bottom aluminum sections reduce the overall cost of the unit. 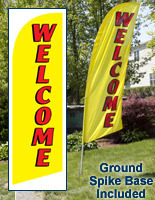 The FOR RENT flag that advertises homes and apartments connects to the flagpole with a cord, ensuring the pennant does not fly off during wind gusts. More and more, homeowners and real estate agents are advertising vacant houses and apartment rentals with blade banners! 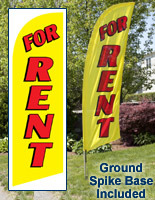 Why is the FOR RENT flag such a great alternative to a traditional yard sign? The reason is large 8' banners over shadow and over power smaller signage, in turn drawing more inquires about property rentals. 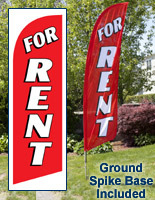 This FOR RENT flag has a versatile design and message to promote both houses and flat rentals! 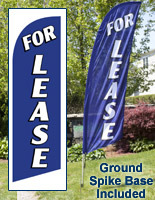 Individuals and property managers can buy this feather banner for the cost of many rental flags! Not only is this outdoor display affordable and easy to set up, but it is durable as well. The ground spike is manufactured from steel so users can hammer it into the ground repeatedly without risk of damaging the unit.